GORGEOUS! You look like a movie star! Love the red lining as well. Can’t wait for it to be warm enough here to wear the first summer dress. Hey, I’d settle for the first spring dress. Yes! WOW! GEORGEOUS! FABULOUS! Great fabric, pattern on the fabric and pattern as well. You look FABULOUS! I LOVE the launderette shots! What a fantastic outfit and photoshoot. Thanks so much Jane. My feet were killing me by the end of the day. Must have hidden it well! lol… thanks Mrs C. That ‘yeeha’ has got me thinking cowboy boots with this dress! Would certainly be more appropriate for this cloudy old day we’ve got today! Thank you, lovely. We did get some funny looks! SO PRETTY! Love the color, print, style, everything! Oh, and that beautifully done red lining… drool-worthy! Thank you AGR. I did give the lining some thought. Always think I could get away with less but so glad that niggling sewing snob voice in my head convinced me to do the whole lot! Thank you Stacey. Can completely relate to what you’re saying. It’s so hard juggling everything. I really did sew this in tiny shifts… 15 mins here, 20 mins there. Can’t say how long it took but often it took longer to get the stuff out and put it away than I gave myself time to sew! Oh to have a sewing room! 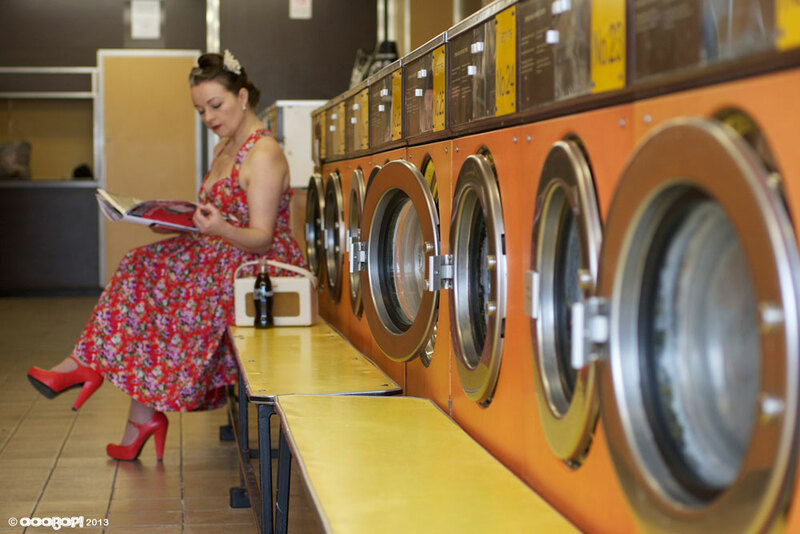 Love those launderette photos – just the right feel for that beautiful dress. Thanks Tialys. That Mr O does have some clever ideas sometimes! This is so inspirational. It turned out lovely! I am in awe of how swish you look. Cracking photo shoot too. Thanks CP! I wonder where he’ll take me next?! Absolutely stunning. And what fabulous photos of you! Thank you Melizza. Let’s hope Mr O doesn’t lose his bug for photography anytime soon! Neat photoshoot, cute dress, and I *love* the shoes. Well done all round! Thank you Kat. I’m rather fond of a nice pair of shoes but boy were they pinching at the end of the day! 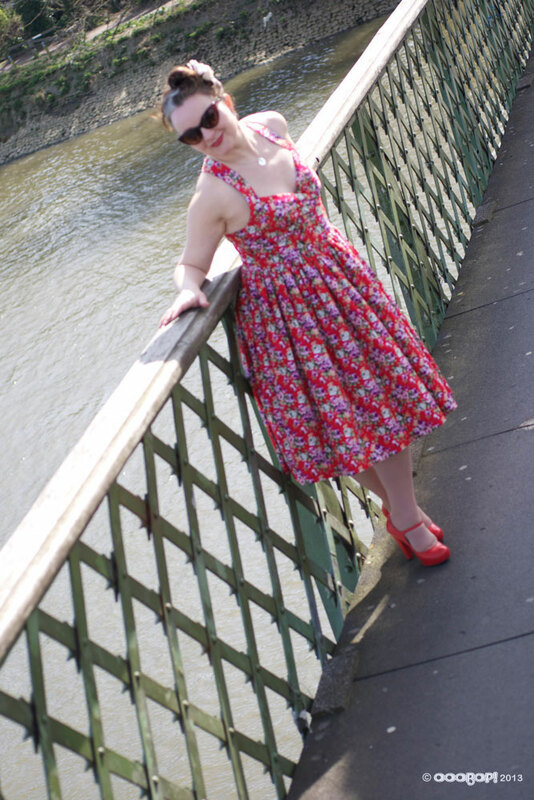 I just hope England gets the best summer ever, so that you can promenade as much as possible in this gorgeous dress. Lining it was such a good idea as it really gives the floral fabric some extra substance. I just love it. Oh my. I’ve only been following you a short while (on MrsC’s recommendation) and I’m not sure I’ve commented before, but This Is Stunning. Divine. Lustworthy. And seeing it on you made me stop for a second and then I sent a text to MrsC asking her if she thought we had a similar shape. I’ve always avoided gathered skirts on the basis they won’t suit me but this looks gorgeous on you and I suddenly thought that we have some similarly proportions going on so maybe I COULD brave a gathered skirt! MrsC confirmed my suspicions and now, thanks to you, I’m going to try one! Eventually… (so many projects. So little time). It’s so glamorous! Great pictures, especially the laundrette ones. Thank you Catherine. It was a fun shoot! from a very sunny Malta 25 deg but we still take a long time to start removing our winter clothes here…..
Fabulous! You do the best photo shoots! Whow, the dress is just gorgeous, as are the pictures! Here’s to many more days when it is warm enough for dresses like this! Tried to leave this earlier but child grabbed the laptop. Anyway, this is absolutely stunning. You were right about the skirt, it needed the fullness, none of the options on the pattern would have done it justice. And great photos! Hopefully you have persuaded the warm weather to stay. Good Lord. Just when I think you have all the talent in the God given universe BOOM! You make this!! And LINE it like you could wear it reversed?? Are you serious?? Props and kudos and candy bars girlie. You are astounding. What a fun photoshoot! The dress is beautiful! I love dresses that are pretty on the inside and the out. 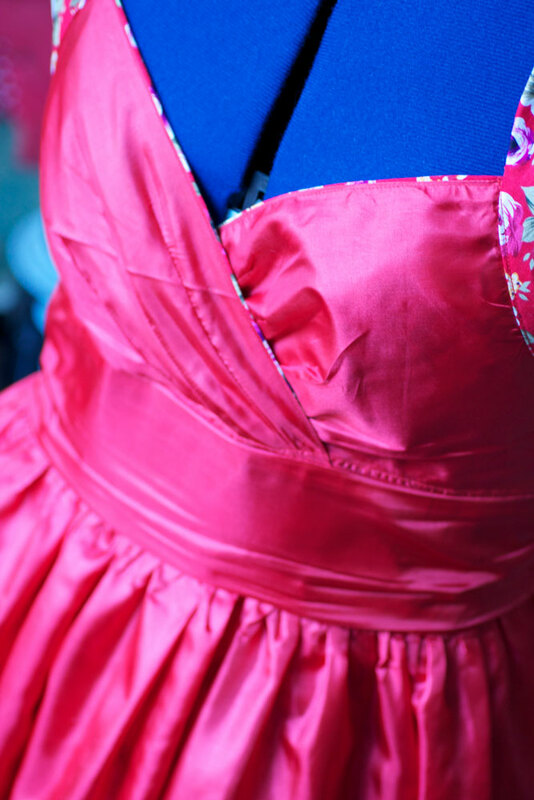 The shape of the bodice is so flattering, and I like how the straps cross in the back. If you find a decent strapless bra, let me know. I have never had luck with that. i love it! totally adorable and the pics in the launderette are perfect! Thanks so much Bea. I’m patiently waiting for the sun. 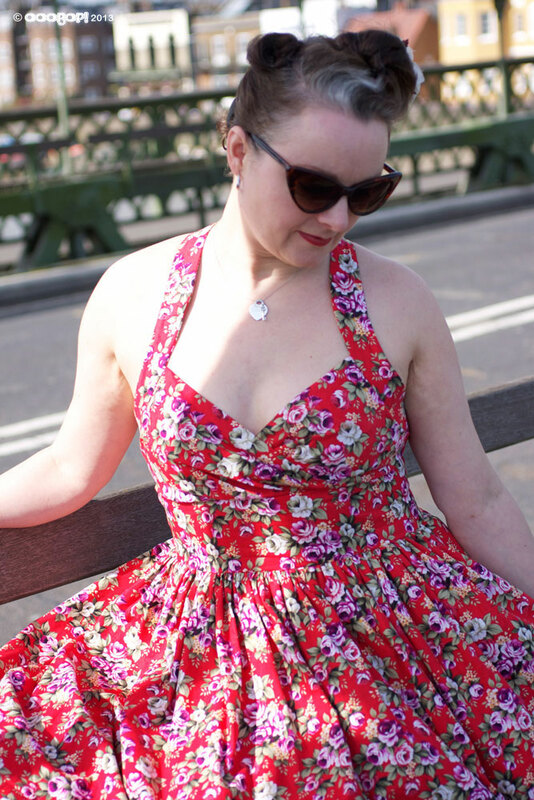 Desperately need to include this dress in a Me Made May day… running out already! Very pretty! Is the fabric something still available? I really love the red floral! We are getting about 8 inches of snow. jealous of the sunny weather. The dress is beautiful and the lining, it almost looks reversible it’s so awesome! Oh wow! This is absolutely gorgeous! I love that fabric. What an adorable dress! 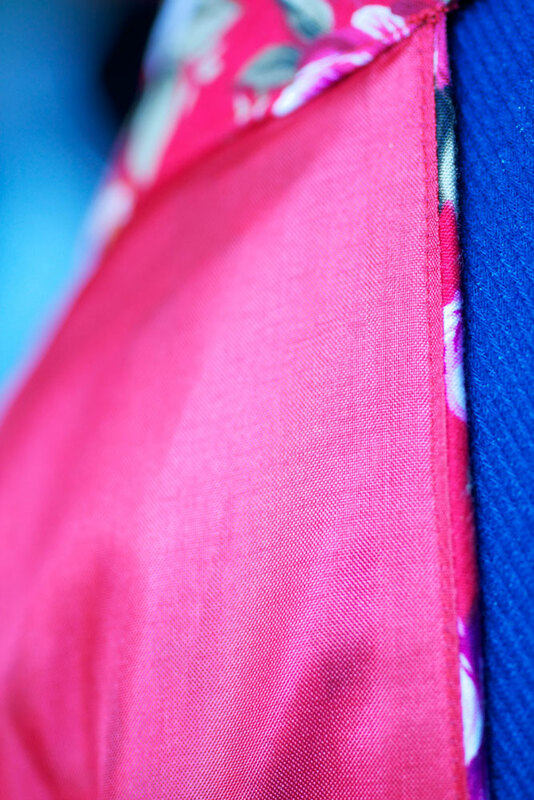 Top choice in fabric and your skirt mod has made this totally perfect! Another dress that you would never match to the original pattern envelope!! Gracious! What a beautiful thing you’ve made! Thanks for sharing your ruminations about the circle vs. dirndl issue. Good food for thought. 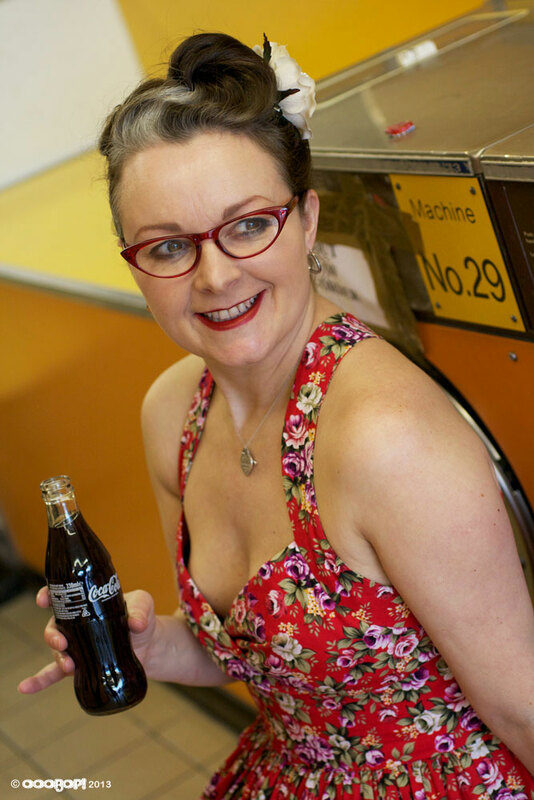 Love the laundromat photos…what a clever fella you have. Wow! That sure turned out amazing! And those shoes… just perfect. Where did you get your shoes anyway? Yes, it is gorgeous!!! And your work is perfect. 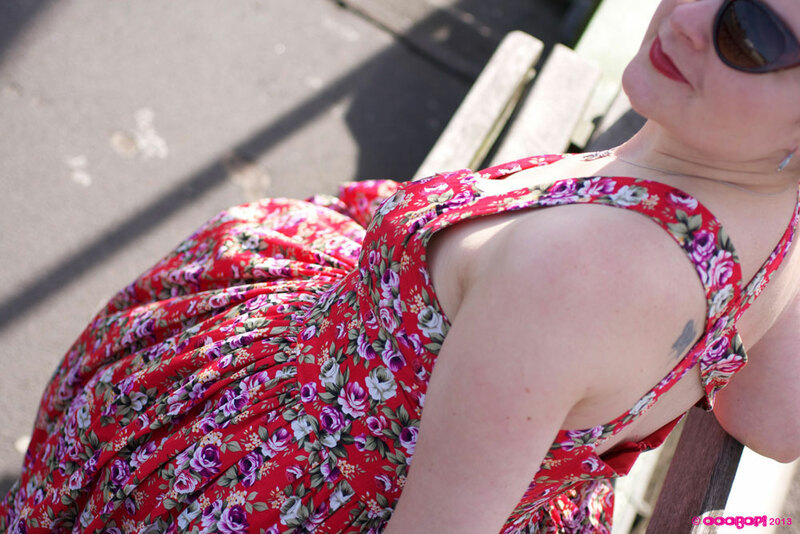 I remember dresses similar to that from when I was a kid back in the 50s and early 60s…love it! Wow! That is absolutely stunning. Wonderful work and attention to detail. Living the rockabilly vibe. Absolutely gorgeous!!! What an inspired photo shoot location! I love how the vibe of the laundromat fit with the style of the dress! What a great dress and your styling is so cool. Love your hair and you took some really awesome photos! Just dashed out for some pom poms to join the cheer squad! Fabulous summer dress and very cheery as winter descends upon Sydney. I love your dress and it looks amazing on you. In fact, your whole photo shoot is causing pangs of envy – perfect dress, shoes, hair, everything. I hope you get to wear it lots this summer. You look stunning! Love the red shoes, I wear my red shoes like I wear underpants!! That is gorgeous! I love it! Unfortunately it’s still winter over here. I know… the calendar says April but I step outside and I could swear it’s still February. Makes it a bit hard to get in the mood for spring sewing. Pingback: How my Elisalex ‘test garment’ happened! | ooobop! Thank you SO much for this post! 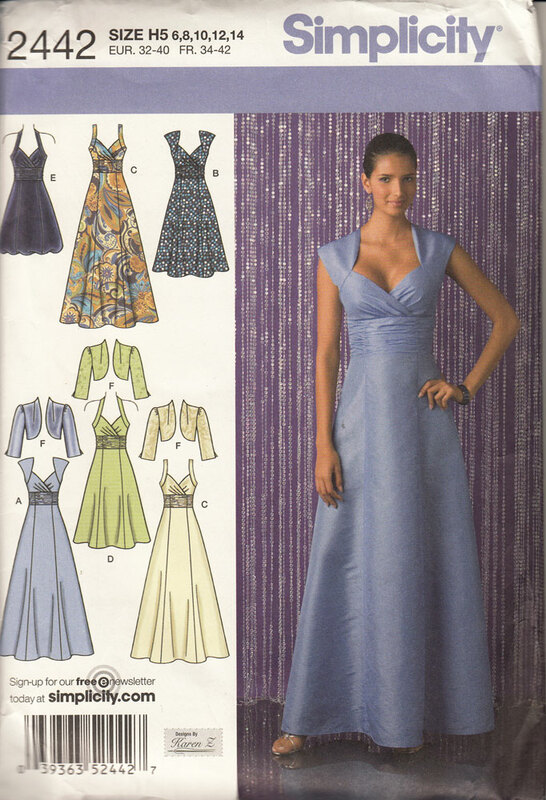 I have been looking for ages for a pattern with a similar neckline and straps to use for a wedding dress next year. I’ll do it with a circle skirt (you’re right, the pattern skirt is kinda lame!) and a lace overlay. This was very helpful! Next PostNext How my Elisalex ‘test garment’ happened!